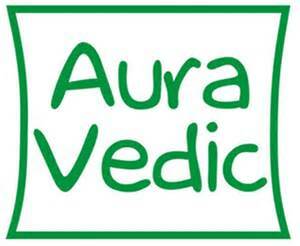 Usage: Gently massage onto skin until completely & thoroughly absorbed. Use 2-3 times day & night. Buy Online: You can buy this from online portals such as Nykaa, Amazon & their website as well. Click HERE. Ingredients: Extracts of Red Sandal, Saffron, Turmeric, Amla, Licorice, Aloevera, Arbutin, Jojoba Oil, Wheatgerm Oil, Stearic Acid, C14-22 Alcohol & C12-20 Alkyl Glucoside, Coconut Oil, Shea Butter, Cetostearyl Alcohol, Beeswax, Triethanolamine, Carbomer, Fragrance, Phenoxyethanol, Enthylhexyl, Glycerine, Potassium Sorbate, Butylated Hydroxy Toluene, Purified Water. Packaging: The Skin Lightening Formula comes in a plastic, mirror-like jar with screw open lid. The labelling has been done in pastel & pale yellow. The lid has reflector paint onto it but because the label is stuck there, you can’t really use it as a mirror. Once you unscrew the lid, there’s an additional layer of plastic stopper which makes it leak proof. Although, for a cream I’d prefer some sort of tube packaging rather than a tub for more convenience. But I must say the graphics of the labelling are really appealing. When I first opened the jar, I was amazed at the quantity offered plus the amount of the content that actually goes into application. If used religiously, you can work with a single jar for maximum three months! Now, you guys know I have an oily skin type which is not only acne prone but also rebels to anything cream based. This was also the reason why I was sceptical to use this one right here. The humid, Delhi’s weather is responsible for that as well. You cannot even think of applying anything on the face except some compact/ translucent powder to take off humongous amounts of downpour of sweat! 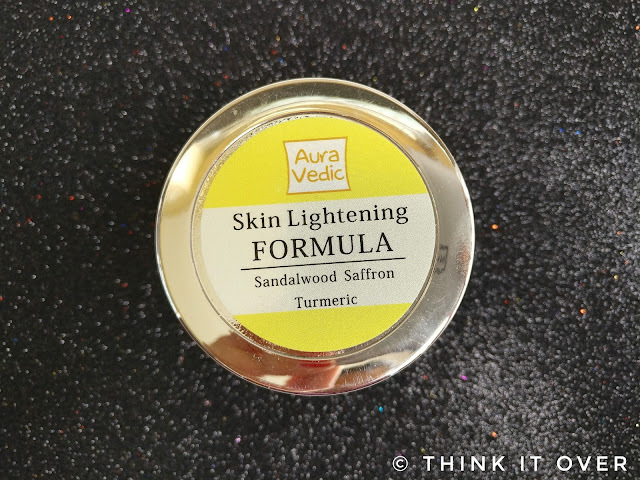 So after a lot of courage, I tried the Aura Vedic Skin Lightening Formula. 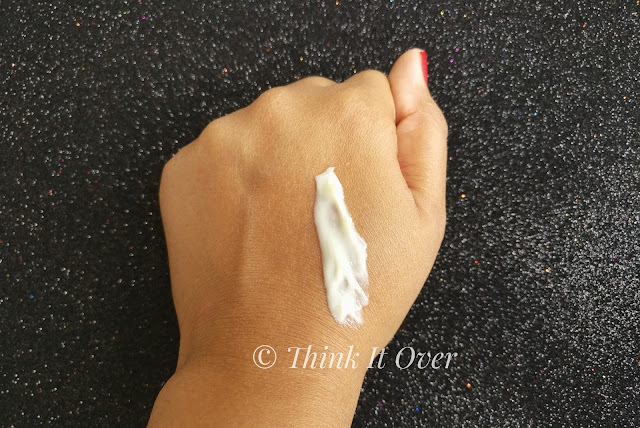 The fragrance of this cream is very sweet, though not too overpowering. And it does vanish once you apply the same onto your face. 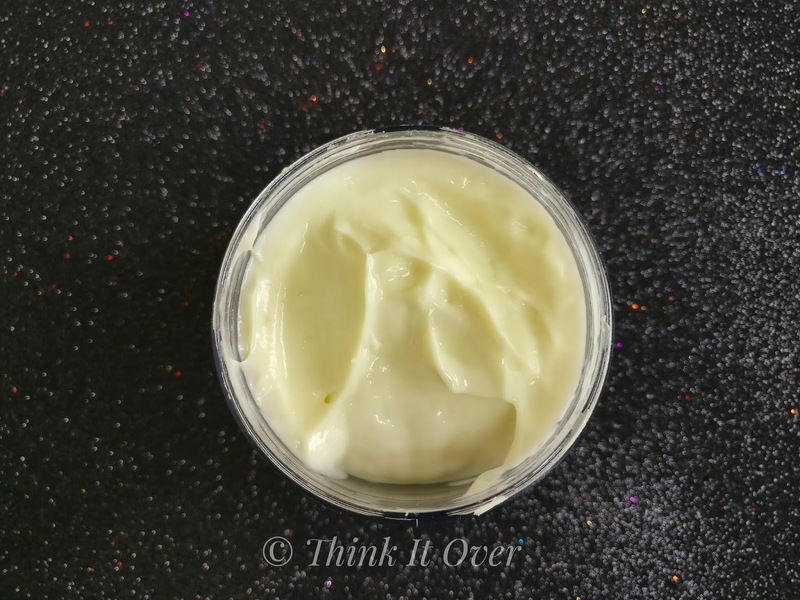 This formula, unlike the heavy creams or body butters, doesn’t have a thick consistency but really smooth texture for application. Endowed with Shea Butter, it helps to evade any kind of dry or flaky skin. 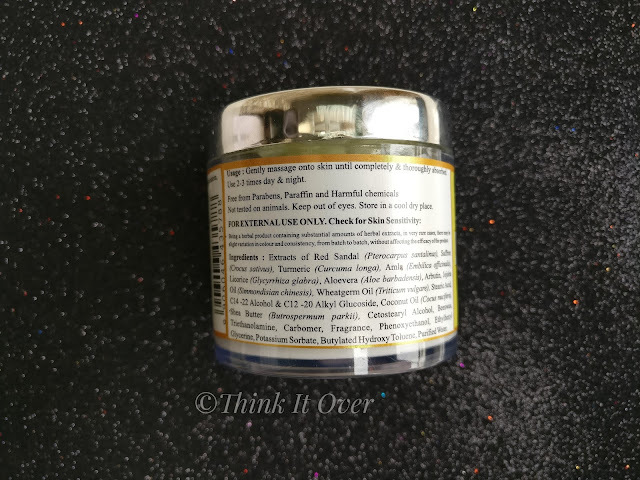 It makes the skin hydrating and as an immediate result I’ve seen slight rectification of uneven skin tone. Just an advise, in case you have oily skin type you might feel sweatier post application. It is ideally suitable for dry to combination skin type. When I went out applying this, it caused a lot of facial sweating & of course I knew the reason. You can dust off some translucent powder but then I prefer to not do so over skincare product’s layer. In case of lightening of the pigmentations or dark spots; I have some of them on my cheek since two years, left from acne attack. Although with time they’ve faded somewhat but still can be detected. I can’t deny that this does not work upon spots but you gotta consistently use it as stated on the packaging. ▶ Good amount of content received. ▶ Doesn’t cause new breakouts. 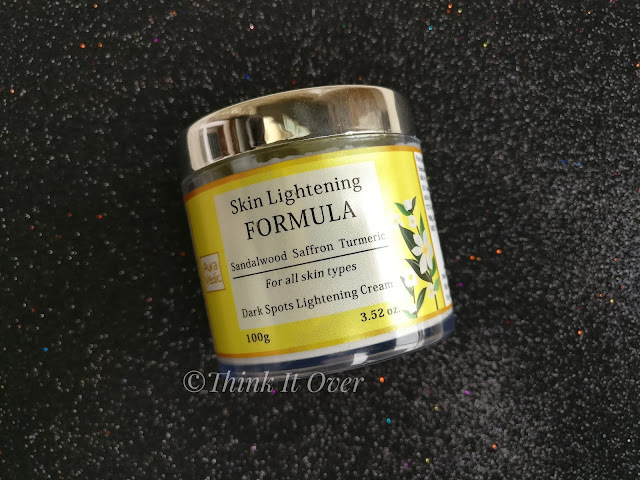 ▶ Helps in pigmentation & dark spots. You can’t expect 1 day results within skincare. In case you have dry to combination skin type and are seeking saviour for pigmentation, then definitely opt this one. But for the people with oily skin type, you can give it a skip or use as a night treatment cream! I have oily skin so might skin this one !!! Nice review!! Loved your review nice product seems effective!